In this amazingly comprehensive work, Isaac Asimov tells the story of life on our planet from the Big Bang to the end of World War II. 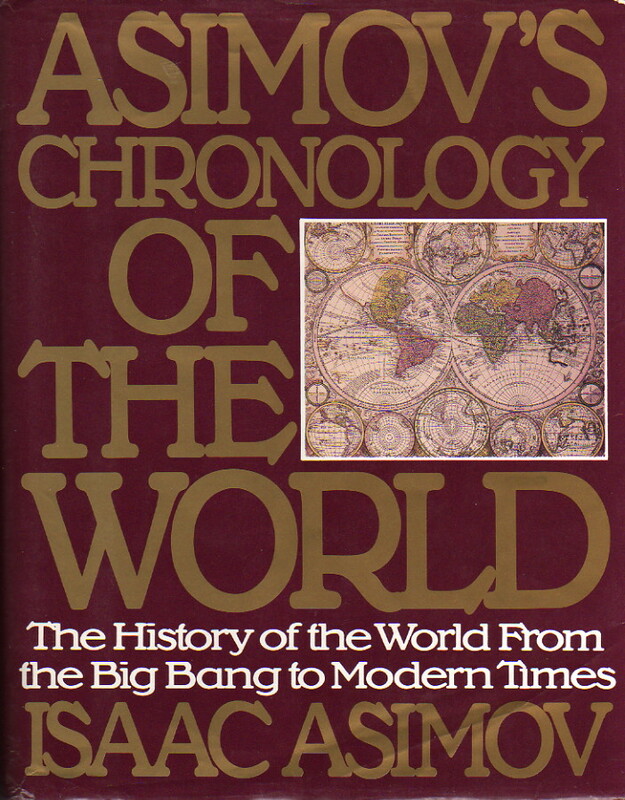 Asimov’s Chronology of the World describes events that occurred all around the globe—first evolutionary, then cultural, political, military, social, and technological developments—within specific time frames. This panoramic point of view lets you see the rise and fall of species, the advances and retreats of science, the highs and lows of art, the victories and defeats of nations, and more. You’ll learn about the influences that various cultures have had upon one another, and gain a new appreciation of the vast sweep of time itself. Asimov’s irresistibly lively writing makes this book a great browse as well as a useful reference—and, the extensive timeline puts all of the world’s history in its proper perspective. Now this is a book. I mourned for years the fact that Asimov’s history series for Houghton-Mifflin, which had started out with such a bang with The Greeks had petered out with his disappointing volumes on US history and ended altogether with The Golden Door. I was unhappy that he never got around to writing histories of areas such as Africa (other than northern Africa), India, China, or Japan; I was unhappy that he didn’t cover medieval history except for France and England and modern history except for the US through the 1920’s. I wanted more. And, standing and waiting eventually paid off. The book works period-by-period—early on, the periods are large—even skipping the ones which last billions of years—and in the end he goes by blocks of less than a decade. In each period, he discusses everything of relevance for the whole world. Now, he still tends to focus rather heavily on Europe and give the rest of the world short shrift, and that’s a problem—but at least he covers them, however briefly. And he tends to get fuller and fuller, of course, as the “Western” world expands to cover the whole globe. Within each period, he goes region by region to discuss what happened there. I was expecting this to make the narrative too choppy (as is the case with the Biographical Encyclopedia), but surprisingly it doesn’t. Rather—given the complex interrelationships between various areas— we get a stronger narrative of the entire picture. Granted, there are places where he has to stop and say, “I’ll talk about this in a bit when I get to the history of such-and-such an area for this century or decade,” but that’s less of an annoyance than I’d anticipated. I would have had trouble believing that Asimov would have been able to top his early history books, but here he frankly does, to my infinite relief and delight.